2012.07.18 [ Android ] Json 방식으로 묶기. 2012.03.21 android json parsing .. json 파싱하기. 2012.03.21 퍼즐 슬라이딩할때 사용한 ontouchevent 사용하기. soft keyboard 만드는것도 일종의 앱이다. 공유메모리를 활용하면 다른 앱과의 통신도 가능할듯..
공유메모리를 이용하면... 브라우저에 플러그인개발이 이때 들어가는군.. 그냥가져올순없나..
Download the source of this article. When using an application, we have to fill out alpha numeric fields. Since most phone or tablets don't have a full keyboard, Android offers us so called soft keyboards. 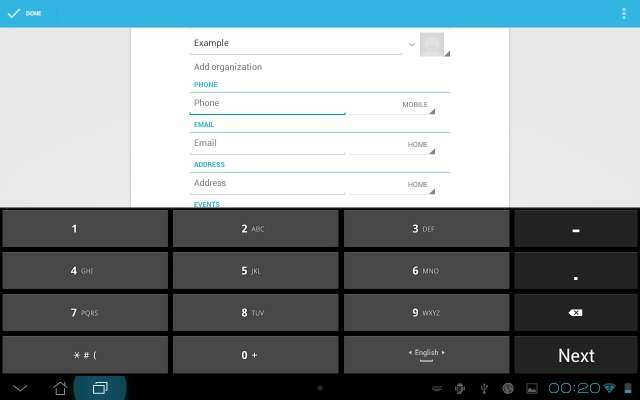 In the figure below (left), we see the full keyboard on tablet. It should be noted that Android's soft keyboards are context sensitive: when the field is a phone number a different keyboard pops up (see the right figure below). Entering a contact's name (left) and his phonenumber (right) with the standard Android Keyboard. This question addressed in this article is: how can a developer offer a custom keyboard. More specifically we have a field that requires a hexadecimal number to be entered, so we are looking for a keyboard with the keys 0 to 9 and a to f.
What kind of keyboards exist, next to the standard Android keyboards? One of the first things we notice on an Asus tablet is that we have the choice of using the standard Android keyboard, or using an Asus keyboard. The figure below shows the full text (left) and phone number only (right) keybaords of Asus. Entering a contact's name (left) and his phonenumber (right) using the Asus keyboard. We see big differences. The Asus phone keyboard has fewer keys (it doesn't have the obscure -/+/,/. keys), whereas the Asus full keyboard has more keys (it does have keys for all digits). We saw above that manufacturers have the ability to add keyboards, where they are completely free in chosing a layout. Can we do that as an end-user? For example, we can install the Hacker's keyboard. Please note that installing a keyboard is not without risk: all keys pass this application, and this includes your passwords! Entering a contact's name (left) and his phonenumber (right) using the Hacker's keyboard. We see again big differences. Most notably, we see cursor keys and extra 'shift' keys (control and alt). And they work (including ctrl-v to paste)! Besides the fact that a user can select which keyboard "service" (yes, each of these keyboards - Android, Asus, Hackers - runs a task) is active, we notice there is another mechanism to select which keyboard "layout" (full, phone) is chosen. Who choses that? It's the application programmer that makes that choice. For example, an EditText has a field inputType that decides which layout to use. For example android:inputType="text" selects the full keyboard andandroid:inputType="phone" select the phone number one. See the developer site for the other types. An no, there is no input type for hexadecimal numbers. Besides the keyboard services with multiple layouts, we see another approach. 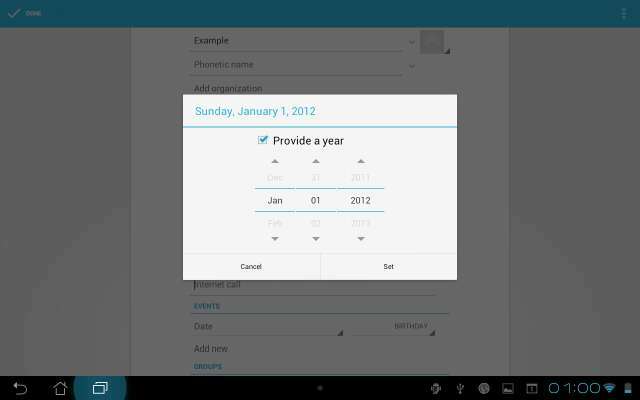 For examle, when we have to enter a date, we do not get a date specific keyboard, rather we get a date specific dialog. See the fgure below. A dialog geared towards a specifc type of field (date in this case). We could write our own keyboard service. But that looks like a hell of a lot of work (multiple layouts, accents, spell check support, locale specific fonts). Furthermore, it means that our customers (the end users of our app) not only have to install our app, but also the keyboard service (second apk?). They are not likely to do that, because wise users see the security issues with that. Finally, it probably will not help anyway. The reason is that there is no inputType for hexadecimal, so our app can not even request a hex layout to the keyboard service. So, writing a keyboard service is definitly a no go. But wait, there is this badly known KeyboardView. What's that? Let's have a look at the KeyboardView class. 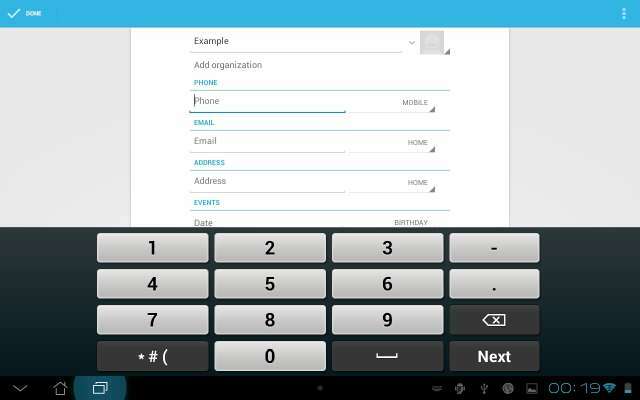 Since API level 3, Android has a KeyboardView. As the name suggests, this is a View, so it is part of the layout of an activity. This is good news an bad news. It is bad news, because it means we have to obscure all layout files of our applications with a view for a keyboard. It is good news, because it means we are in full control in our app. But wait, what will the KeyboardView show? The answer to this is that we have to associate a Keyboard with the KeyboardView. A keyboard consists of Rows, and rows consist of Keys, and keys are associated with alabel (what is shown on the key button) and a code (what is sent to the app when the key is pressed). But it is not that bad: a Keyboard can be setup with a single (ok, rather large) xml file. It lists all rows, their keys, and per key the label and the code. So, what we see in practice is a KeyboardView in our activity (activities), one or more xml files with a keyboard layout (in our case one file describing a hexadecimal keyboard layout), and a single line of code to assign the Keyboard to the KeyboardView. And then there are some issues in when to show the keyboard. The KeyboardView is a View like any other, so we include it in the layout file of our activity. Nevertheless, there are a couple of noteworthy remarks; they are marked red in the code fragment below. First of all, the KeyboardView will be used to show a keyboard. Typically, keyboards are at the bottom of the screen (android:layout_alignParentBottom="true"), filling the complete width (android:layout_width="fill_parent"); this is easily achieved in RelativeLayout (maybe throw in a vertical scroll bar). Secondly, the keyboard is hidden by default (android:visibility="gone"); we use thegone value instead of invisible to completely hide it. Thirdly, the KeyboardView, for reasons unknown to me, is not part of a package that is automagically found. So, we need to add the full path (android.inputmethodservice.KeyboardView). Unfortunately, the graphical layout editor in Eclipse cannot find that package either. So it gives an exception (java.lang.NoClassDefFoundError: Could not initialize class android.inputmethodservice.KeyboardView) and the keyboard is not shown. I have no idea how to fix that (I would expect that I could add a search path to the graphical layout editor in Eclipse). The feedback I got from Jan, is that Android Studio gives the same complaint. The prevous section showed how to create a KeyboardView. This is a view, so this was most easily done in xml: the actvity has a layout file activity_main, which contains a view of type KeyboardView with idkeyboardview. The second step is to create a Keyboard. A Keyboard is a data structure describing rows of keys, each with their label and key code. A large part is also done in xml (file hexkbd), and a small part is done programatically; see the code fragment below. 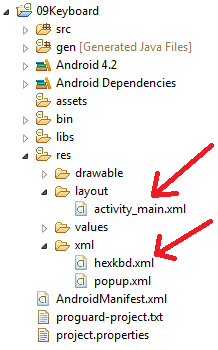 The image below shows where the two xml files (activity layout and keyboard layout) are located. The location of the xml files. The xml file hexkbd describes the complete keyboard. Recall that we want to make a hexadecimal keyboard, so we have relatively few keys. In order to illustrate some points, we have added a number of keys: backspace/clear all, cursor left/right, cursor begin/end, prev/next field and keyboard hide button. The design of our hexadecimal keyboard. Observe that we have a 'keyboard hide' button (centre of the lowest row). Many KeyboardView keyboards have this because the normal 'hide keyboard' feature in the system bar doesn't work anymore. We can see this in the figure: the bar at the bottom still shows the 'Back' soft key instead of the 'Hide keyboard' softkey. One of the great features (I miss that in activity layouts...) is the fact that (key) sizes can be expressed in percentages relative to the parent container (by using %p as unit). This also means that we have no (ok little) worries on landscape versus portrait. When we define a keyboard, we have three levels where we can set properties: at keyboard level, at row level, and at key level. Since most keys on a keyboard have the same size, it makes sense to set the keysize at the keyboard level, and have some overrides at key level. As we can see in the figure above, each row in our hexkbd has 3 keys, a gap of half a key, 2 keys, again a gap of half a key, and finally 2 keys. This sums up to 8 keys, so the key width is 1/8 of 100% or 12.50%. We set the key height to 10%, which means that the full keyboard (4 rows) takes 40% of the complete screen. We have two width overrides: the '0' key has double width (25%) and the 'keyboard hide' key has double width (25%). These size settings are shown in blue in the code fragment below. We can also make tall keys. For example, we could add android:keyHeight="20%p" to the 'F' key, so that it becomes twice as tall. It would then overlap with the 'keyboard hide' key. To prevent that we would typically make the 'keyboard hide' key half the width (12.5%) and add a larger gap (18.75%) before 'PREV' (see below). To make everything work across different screen sizes, you may want to put things like the keyboard's keyHeight value in device-dependent resource directories. If you use percentages for that (using "%p"), you need to create "fraction" resources (referenced by @fraction/). Thanks for the tip Jan! Another feature is that we can offset (indent) a row of keys (as we did with the last row), or even (as we also did) add gaps to create islands of keys. Use the attribute android:horizontalGap for that, and my advise is to use percentages here too. The gap settings are shown in red in the code fragment above. 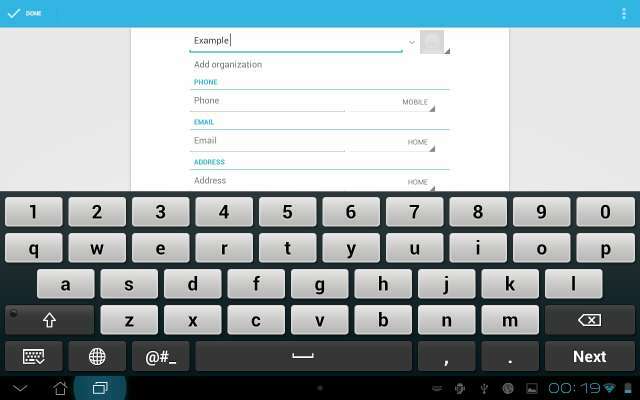 It is possible to add android:horizontalGap and/or android:verticalGap on keyboard level. This is most useful when we want to add a tiny amount of space between all keys. It is tempting to do that in pixels, but this interferes with the key size (width/height) in percentages; they no longer add up to 100%. The keyEdgeFlags are a bit magic. In all the examples I found, the attribute android:keyEdgeFlags="left" is at the left most key in a row and the android:keyEdgeFlags="right" is at the right most key. But when absent, the keyboard still layout's nicely. Because every body seems to do it, I included these flags too. The documentation suggest it has to do with handling touch events: "Flags that specify the anchoring to edges of the keyboard for detecting touch events that are just out of the boundary of the key." The next issue to settle is the labels on the buttons. There are two options: strings and drawables. String are associated with the attribute keyLabel. As an example, consider the single character labels android:keyLabel="0" or android:keyLabel="A", or the multi character labels android:keyLabel="CLR" orandroid:keyLabel="NEXT". Jan points out that multi character labels have a smaller font than single character labels because they use labelTextSize instead of keyTextSize, see documentation. Drawables are associated with the attribute keyIcon. 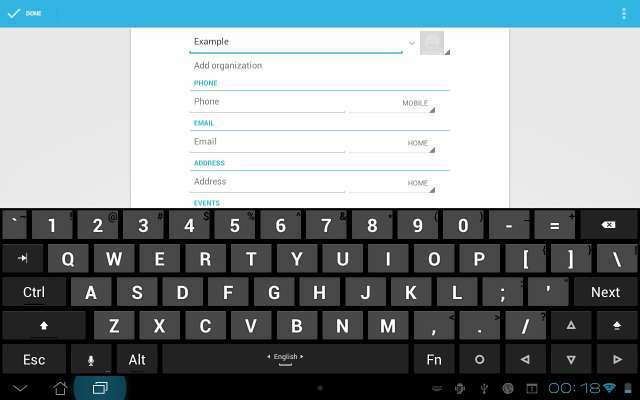 As an example consider android:keyIcon="@drawable/sym_keyboard_allleft" shown below. Please be aware that smaller screens still need some precaution. 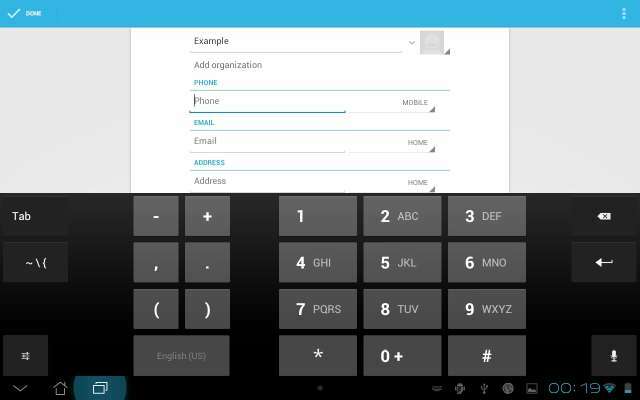 The figure below shows the same keyboard on a phone. Notice that the icons are too big (this can probably be fixed by including the icons in several resolutions in the res/drawable_xxx directories) and that even plain text labels might become too big ('prev' and 'next' are on the border). I have no idea how to change the background color of some keys as is done with the shift/tab/backspace key in the standard keyboard. Will Verduzco wrote a followup article, that touches on the subject of styling. When a key is pressed,the KeyboardView calls the onKey() of its OnKeyboardActionListener. It passes the key code of the key. The key codes are declared in the xml file. For example, for the 'A' key we use the key code 65. The keyboard is completely app specific: the application has to provide the key handling in the onKey(). This means that the key codes can be chosen freely. Nevertheless, the key handler becomes simpler if we use some standard (e.g. Unicode) for plain keys. And that's what we did in the example. For the non plain keys (cursor movement, delete), we pick some arbitrary number; the example uses 55000 and higher. When there is no keyCode, the KeyboardView derives a code from the label. When key android:keyLabel="A" does not have a key code, its gets 65! When key android:keyLabel="PREV" does not have a key code, its gets 80 (the Unicode of 'P' is 80). When a key does not have a code, nor a label, an exception is raised. A nice feature is the attribute android:isRepeatable="true". It makes the key auto repeat as long as it is pressed. We have used this for the cursor movement and delete. If we look at the details, there is some unexpected flexibility. Each key may declare a list of key codes (with a maximum of twelve? ), such as android:codes="65,66,67". When the key is pressed, the onKey(int primaryCode, int keyCodes) is called. The array keyCodes contains this list; it is always (?) twelve integers long where the start of the list has the declared key codes and the list is padded with -1's. The first element of the list is always passed as the primaryCode parameter. The documentation explains the use: "The alternatives will include other characters that may be on the same key or adjacent keys. These codes are useful to correct for accidental presses of a key adjacent to the intended key". An advanced feature is that a key can have a popup. It appears when the key is long pressed. 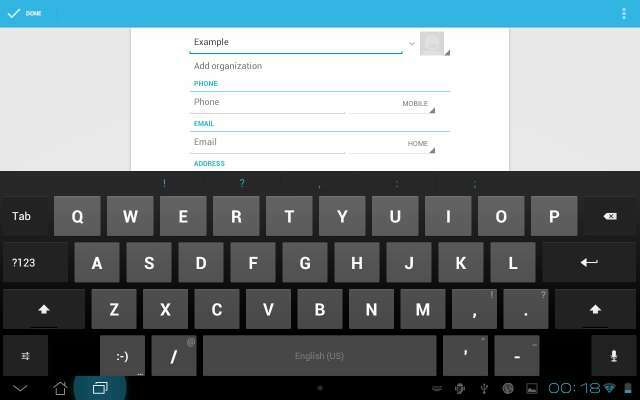 This feature is known from the standard Android keyboard as well: the popup shows alternative keys. For example, a long press on 'e' typically shows 'é', 'è', 'ë' etc. There are two ways to make a popup keyboard: generic and dedicated. The dedicated way is to add an element to a key specifying a keyboard layout for the popup keyboard. 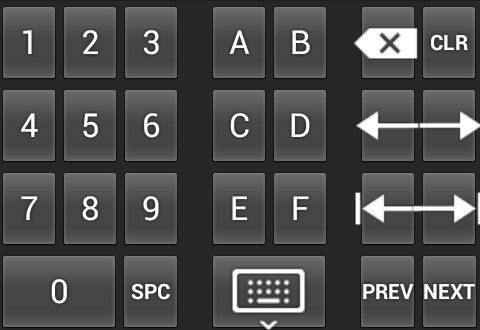 For example, we could add android:popupKeyboard="@xml/newkeyboard" to some key. This requires an xml filenewkeyboard which has all the features of the main keyboard. The generic way is to add an element to a key specifying the labels (with implict codes) of the popup keys. For example, we could add android:popupCharacters="aA" to the 'A' key. This does require require an xml file, but only with keyboard level attributes. The key is decorated as follows. The popup.xml has the following content. We have to write the key handler ourselves. For this, we add the red code to the creation of the keyboard. As mentioned above, the OnKeyboardActionListener has an onKey(), but it has many more methods. We only override the onKey(). It searches for the view in focus (if it is not an EditText, we abort). Then it executes an action based on the actual key code (for a list of key codes, see below). The key codes are the codes used in the xml file; they have constants in the java class. One of the hardest issues with the KeyboardView is making it visible at the right time. There is only one thing harder: making the standard keyboard invisible at the same time! Let's start by writing the methods that show respectively hide the custom keyboard. After that, we focus on when to call them. The showCustomKeyboard() will be called when and EditText is getting focus. We not only show the custom keyboard, but also actively switch off the standard keyboard. Now to when to show or hide the custom keyboard. The model that we use is that our custom keyboard is "coupled" to one (or more) EditTexts. When a "coupled" EditText has focus the custom keyboard should be visible. By setting the OnFocusChangeListener of the EditText, we can show the custom keyboard when the edit box gets focus, but also hide it when the edit box loses focus. However, this listener only gets called at the transition of getting (or losing) focus. If the EditText has focus, but the keyboard is hidden (e.g. after pressing the hide keyboard button) how can the user make it visible again? The standard keyboard allows a re-tap of the EditText in focus. Let's mimick that. We are nearly there. When our activity starts, with a coupled EditText in focus, the standard keyboard is displayed. If have no idea why, I would expect the last statement in showCustomKeyboard() would have hidden it, but it hasn't. We add one more line (the red one) to the creation of the keyboard. As a final step, we would like the back button of the activity to close the custom keyboard (if it is open). Therefore, we add the following code to our activity. Still, Android is persistent in poping up the standard keybaord. There is one certain way to stop Android doing this: add edittext.setInputType(InputType.TYPE_NULL) to tell Android that we won't be doing any editing on the EditText. However, this has one small issue, Android won't be showing a cursor. And no, edittext.setCursorVisible(true) doesn't help (I consider this a bug). A cursor in an EditText. If you don't need a cursor, you're done. But we want a cursor: we have added cursor keys in our custom keyboard. So, we can not set the input type to null, we set it to text. As a result, we have to standard keyboard poping up. I found the following work around on the web (forgot where...). The trick is to have the input type set to text (so that the cursor is always visible), but just before a key press, we set input type to none and call the base class handler. This way, the base class handler only sees input type none and does not pop up the standard keyboard. It is not uncommon that multiple EditTexts need the same custom keyboard. We can solve that be writing all EditText related code in a registerEditText method, and call it for all the EditTexts that need the keyboard. To make it easier to use a custom keyboard; we can move all keyboard code to a seperate class. The activity then just registers the EditTexts. 이러한 경우 특정 바이트 크기를 잡고 좌측이나 우측에 패딩값을 넣고 전송하고 split 해주면된다. 앱에서 블루투스 기능을 사용하기 위해서는 먼저 적어도 BLUETOOTH, BLUETOOTH_ADMIN 중 하나는 선언해야 한다. 연결, 연결 수락, 데이터 교환 등의 블루투스 통신을 진행하고 싶으면 BLUETOOTH 권한을 요청해야 하며 블루투스 설정을 조작하거나 초기 장비를 검색하기 위해서는 BLUETOOTH_ADMIN 권한을 요청해야 한다. 대부분의 앱은 로컬 블루투스 장비들을 검색하기 위해 전적으로 이 권한을 필요하다. 만약 사용자가 블루투스 설정을 변경하는 파워 관리자일 필요가 없다면 이 권한을 요청할 필요는 없다. 만약 BLUETOOTH_ADMIN 권한을 가지면 BLUETOOTH 권한에서 허가된 기능도 수행할 수 있다. 앱의 매니페스트에 블루투스 권한을 선언은 다음과 같이 <uses-permission> 엘리먼트를 사용하면 된다. 앱이 블루투스 상에서 통신을 하기 이전에 먼저 블루투스가 장비에서 지원하는지와 활성화되어 있는지를 검증해야 한다. 만약 블루투스가 지원되지 않는다면 앱의 어떠한 블루투스 기능도 자연스럽게 비활성화 시켜야 하며 만약 블루투스가 지원되지만 비활성화되어져 있다면 앱을 떠나지 않고 블루투스를 활성화 시키도록 요청할 수 있다. 이러한 작업은 BluetoothAdapter 를 사용하여 처리한다. BluetoothAdapter는 어떠한 블루투스 액티비티에서 요청할 수 있다. BluetoothAdpater를 얻기 위해서는 static getDefaultAdapter() 메서드를 호출한다. 이 메서드는 장비가 소유하고 있는 블루투스 어댑터에 대한 BluetoothAdapter 객체를 반환하며 이 어댑터는 전체 시스템에서 하나만 존재한다. 그리고 앱은 이 객체를 사용하여 어댑터와 연동할 수 있다. 만약 getDefaultAdapter()가 null을 반환하면 장비는 블루투스를 지원하지 않는 것이며 블루투스에 관한 어떠한 작업도 할 수 없다. 다음으로 블루투스를 활성화 시켜야 하는데 먼저 isEnabled() 메서드를 통해 현재 활성화 상태인지를 확인할 수 있다. 만약 false이면 블루투스가 비활성화 되어져 있는 것으로 활성화 상태로 변경하려면 ACTION_REQUEST_ENABLE 액션 인텐트와 함께 startActivityForResult()를 호출해야 한다. 이것은 앱의 중지 없이 시스템의 설정을 통해 블루투스를 활성화 시키는데 목적이 있는 요청이다. 위의 코드가 실행되면 블루투스를 활성화 시키기 위한 사용자 권한을 요청하는 다이얼로그 장이 표시되며 사용자가 "Yes"를 선택하면 시스템은 블루투스를 활성화 시키는 작업을 수행하며 활성화가 완료되면 앱으로 다시 복귀된다. 만약 블루투스 활성화가 성공하면 복귀된 액티비티는 OnActivityResult() 메서드에서 result code에 RESULT_OK를 받을 것이고 만약 "No"를 선택하여 블루투스를 활성화 시키지 않았다면 result code는 RESULT_CANCELED 이다. 옵션으로 앱은 시스템에서 블루투스 상태가 변경되는 사항을 알아내기 위해 ACTION_STATE_CHANGED 브로드캐스트 인텐트를 받을 수 있도록 설정할 수 있다. 이 브로드캐스트는 EXTRA_STATE와 EXTRA_PREVIOUS_STATE 에 대한 정보가 포함되어져 있으며 이는 각각 이전과 새롭게 설정된 상태를 나타낸다. 이 extra 데이터에 허용되는 값은 STATE_TURNING_ON, STATE_ON, STATE_TURNING_OFF, STATE_OFF 가 있으며 이 데이터를 앱이 실행되고 있는 동안 블루투스 상태가 변화되는 것을 대처할 수 있다. 검색 활성화를 동작 시키면 자동으로 블루투스가 활성화될 것이다. 만약 이것을 블루투스 액티비티가 진행되기 전에 설정하면 2. 블루투스 활성화는 처리하지 않아도 된다. BluetoothAdapter를 사용하면 장비 탐색 혹은 페어링된 장비리스트를 질의하는 방법으로 원격의 블루투스 장비들을 찾을 수 있다. 장비 탐색은 로컬 영역에서 활성화된 블루투스 장비를 찾는 스캐닝 작업을 수행하고 각각에 대해 몇가지 정보를 요청한다. (때때로 이것은 발견, 탐구 혹은 스캔닝 이라고 한다.) 그러나 이것도 로컬 영역 내의 블루투스 장비가 탐색시 발견될 수 있도록 활성화 되어져 있을 때만 가능하다. 만약 장비가 탐색되면 장비 이름, 클래스 그리고 유일한 MAC 주소와 같은 공유 정보를 가지고 탐색 요청에 대해 응답할 것이다. 이 정보는 탐색 작업을 수행중인 장비는 탐색된 장비와의 연결을 초기화하는데 사용할 수 있다. 처음으로 원격 장비와 연결자를 만들 때 사용자에게 자동으로 페어링 요청이 보여진다. 장비가 페어링될 때 장비의 기본 정보(장비 이름, 클래스 그리고 MAC 주소)는 저장되고 그후 블루투스 API들을 통해 읽을 수 있다. 원격 장비가 잘 알려진 MAC 주소를 사용할 경우 같은 범위안에 있다면 연결자를 탐색 작업 없이 어떤때든지 초기화할 수 있다. 페어링됨과 연결됨의 차잇점을 알아야 한다. 페어링된다는 것은 2개의 장비가 인증에서 사용할 수 있는 link-key 를 공유하고 각각 상대방과 암호화된 연결자를 수립할 수 있는 조건을 갖추는 등 서로의 존재를 아는 것을 말한다. 연결된다는 것은 장비가 현재 RFCOMM 채널을 공유하고 각각의 장비 간에 데이터를 송수신할 수 있는 것을 말한다. 다음 섹션은 페어링된 장비들을 찾는 방법과 장비 탐색을 통해 새로운 장비를 탐색하는 것을 설명하겠다. 안드로이드 장비는 기본적으로 탐색되지 않게 되어져 있다. 사용자는 환경설정을 통해 제한된 시간동안 장비가 탐색될 수 있도록 하거나 앱이 앱의 동작을 멈추지 않고 사용자가 탐색 기능을 활성할 수 있도록 요청할 수 있다. 장비 탐색을 진행하기에 앞서 만약 연결하고자 하는 장비가 이미 페어링된 것인지를 페어링된 장비들의 집합을 질의할 필요가 있다. 이 작업은 getBondedDevices() 메서드를 호출하는 것으로 페어링된 장비들을 나타내는 BluetoothDevice들의 집합을 반환한다. 예를 들어 다음은 모든 페어링된 장비들을 질의하고 사용자에게 ArrayAdapter를 이용하여 장비의 이름을 보여주는 코드이다. BluetoothDevice 객체로 부터 연결을 위해 필요한 것은 MAC 주소이다. 여기서는 단순히 사용자에게 장비의 MAC 주소를 표시하지만 뒤에 연결을 초기화하는 데 사용하되는 것을 자세히 살펴보도록 하겠다. 장비 탐색을 시작하기 위해서는 단순히 startDiscovery() 를 호출하면 된다. 이 메서드의 진행은 비동기적이고 탐색이 성공적으로 시작되었는지 아닌지에 대한 boolean 형식의 결과값을 반환한다. 탐색 작업은 보통 12초 정도이며 페이지에는 스캔해서 찾은 장비들의 블루투스 이름을 표시한다. 앱은 각 장비 탐색에 대한 정보를 받으려면 ACTION_FOUND 인텐트에 대한 브로드캐스트 리시버를 등록해야 한다. 장비를 찾을 때마다 시스템은 ACTION_FOUND 인텐트를 브로드캐스트 한다.이 인텐트는 BluetoothDevice 객체가 있는 EXTRA_DEVICE와 BluetoothClass 객체가 있는 EXTRA_CLASS 를 포함하고 있다. 브로드캐스트 리시버에 대한 예제는 다음과 같다. 연결을 초기화하는데 필요한 정보인 MAC 주소는 BluetoothDevice 객체에 있다. 장비 탐색 진행은 블루투스 어댑터에게 무겁고 많은 자원을 소비하는 작업이다. 당신이 연결하기 위한 장비를 찾았다면 항상 연결을 시도하기 전에 cancelDiscovery() 호출을 통해 탐색 작업을 중지시켜야 한다. 또한 만약 장비와 연결시 장비 탐색을 중지시키지 않는다면 연결에 대한 대역폭 활용을 감소시키므로 반드시 연결되어있는 동안은 탐색 작업이 되지 않도록 해야 한다. 만약 장비를 다른 장비들에 탐색될 수 있도록 만들고 싶다면 ACTION_REQUEST_DISCOVERABLE 액션 인텐트와 함께 startActivityForResult(Intent, int)를 호출한다. 이것은 앱이 중지되지 않고 환경설정의 탐색 모드를 활성화 시킨다. 기본적으로 장비는 120초 동안 탐색될 수 있는 상태가 되지만 이를 변경하고 싶다면 EXTRA_DISCOVERABLE_DURATION의 extra 값을 인텐트에 추가하여 호출하면 된다. 앱은 최고 3600 초을 설정할 수 있다. 그리고 0값이면 항상 탐색 모드를 유지하겠다는 의미이다. 만약 0미만이거나 3600 보다 크면 자동으로 120초로 설정된다. 위의 코드가 실행되면 다음과 같이 장비가 탐색될 수 있도록 하는 사용자 권한을 요청하는 다이얼로그가 보여지며 "Yes"를 선택하면 특정한 시간(여기서는 300초)동안 탐색 가능 상태가 된다. 사용자의 선택 결과 값은 액티비티의 onActivityResult()를 통해 전달 받으며 사용자가 "No"를 선택했거나 에러가 발생했으면 Activity.RESULT_CANCELED 가 결과 코드로 전달될 것이다. 만약 블루투스가 장비에 활성화되어 있지 않다면 장비 탐색 가능 모드 작업은 자동으로 활성화 시킬 것이다. 장비는 자동으로 일정 시간동안 탐색 가능 모드를 유지할 것이고 만약 탐색 가능 모드에 대한 설정이 변하는 것을 알아내고 싶다면 ACTION_SCAN_MODE_CHANGED 인텐트에 대한 브로드캐스트 리시버를 등록하면 된다. 전달되는 인텐트안에는 현재의 스캔 모드인 EXTRA_SAN_MODE 와 이전 스캔 모드인 EXTRA_PREVIOUS_SCAN_MODE가 있다. 여기에 가능한 값은 SCAN_MODE_CONNECTABLE_DISCOVERABLE, SCAN_MODE_CONNECTABLE 또는 SCAN_MODE_NONE 이다. 이것은 각각 탐색 가능 모드, 연결을 받아들일 수 있는 탐색 불가능 모드, 연결을 받아들일 수 없는 탐색 불가능 모드를 나타낸다. 만약 원격 장비와 연결을 초기화 할 것이면 장비 탐색을 활성화할 필요는 없다. 앱은 원격 장비를 탐색하여 연결을 초기화할 수 있기 때문에 장비 탐색 활성화는 오직 앱에서 서버 소켓을 통해 연결을 수락할 때에만 필요하다. 2개의 장비에서 실행되고 있는 앱 사이 연결자를 생성하기 위해서는 서버 사이드와 클라이언트 사이드를 구현해야 한다. 하나의 장비는 서버 소켓을 열고 다른 한 장비는 서버 장비의 MAC 주소를 사용하여 연결자를 초기화해야 한다. 서버와 클라이언트는 같은 RFCOMM 채널에 대한 연결된 BluetoothSocket을 가질 때 연결되었다고 할 수 있으며 이것을 통해 각 장비는 input과 output 스트림들을 얻어 데이터 전송을 시작할 수 있다. 이것에 대한 것은 연결자 관리에서 자세히 설명하고 여기서는 2개의 장비간에 연결자를 초기화하는 법을 살펴보겠다. 서버 장비와 클라이언트 장비는 각각 다른 방법으로 BluetoothSocket을 얻는다. 서버는 연결을 받아들일 때 얻고 클라이언트는 서버에 대한 RFCOMM 채널을 오픈할 때 얻는다. 구현 기술 중 하나는 각각 장비가 서버 소켓을 오픈하고 연결 요청을 수락하는 서버와 같이 준비시키고 그 다음 장비들은 상대방 장비와 클라이언트로서 연결을 시작하는 것이다. 아니면 다른 구현 방법은 명시적으로 "host" 로서 수용하는 서버 소켓을 오픈하고 다른 장비는 단순히 연결을 시작하는 것이다. 만약 2개의 장비가 이전에 페어링되지 않았다면 안드로이드 프레임워크는 자동으로 페어링 요청 노티피케이션을 보여주거나 연결을 수행하는 동안 사용자에게 다이얼로그를 보여준다. 그래서 장비들에 연결하기 위해 수락될 때 앱은 장비들이 페어링되었는지 아닌지를 신경쓸 필요가 없다. RFCOMM 연결은 사용자가 성공적으로 페어링될 때 까지 블럭킹되거나 사용자의 페어링 취소 혹은 타임 아웃으로 실패될 것이다. 2개의 장비를 연결하려면 하나는 서버로서 BluetoothServerSocket을 오픈하여야 한다. 서버 소켓은 연결 요청을 듣기 위함이고 하나가 연결을 될 때 연결된 BluetoothSocket을 제공받는다. BluetoothSocket이 BluetoothServerSocket으로 부터 획득되면 BluetoothServerSocket은 더이상 연결을 받지 않아도 된다면 폐기시켜도 괜찮다. 서버 소켓을 설정하고 연결을 수락하는 방법은 다음과 같다. 1. listenUsingRfcommWithServiceRecord(String, UUID)메서드를 호출하여 BluetoothServerSoket을 얻는다. listenUsingRfcommWithServiceRecord(String, UUID)메서드의 String 형식의 파라메터는 앱에서 제공하는 서비스를 구분시킬 수 있는 문자열로서 시스템은 자동으로 장비에 Service Discovery Protocol(SDP) 데이터베이스 엔트리를 저장한다. (이름은 문자를 사용하면 되고 단순히 앱의 이름을 사용해도 된다.) UUID는 또한 SDP 엔트리 안에 포함되어 저장되고 클라이언트 장비에 대한 연결 동의에 대해 기본 정보가 된다. 클라이언트는 연결을 원하는 서비스을 유일하게 구분하는 UUID 정보를 함께 보내 이 장비에 연결을 시도할 것이다. UUID가 매칭이 될 때 연결이 수락된다. Universally Unique Identifier(UUID)는 정보가 유일하게 구분되게 하는데 사용되는 문자열로 된 ID로 128-bit 형식을 가져야 한다.UUID의 포인트는 랜덤으로 선택해도 충돌하지 않을 정도로 충분히 크다는 것이다. 이 경우에는 앱의 블루투스 서비스를 구분하는데 사용하는 것이다. 당신은 UUID 클래스의 fromString(String)을 사용하여 생성할 수 있다. 2. accept() 메서드를 호출하여 연결 요청을 듣기 시작한다. 이것은 블럭킹 호출이며 연결이 수락되거나 예외사항이 발생할 때 반환한다. 연결은 원격 장비가 서버 소켓을 생성할 때 등록한 UUID와 매칭되는 UUID를 가지고 연결 요청을 보낼 때만 연결을 수락한다. accept()는 연결을 수락하면 원격 장비와 연결된 BluetoothSocket 객체를 반환한다. 3. 만약 추가적인 연결을 수락하지 않으려면 close() 메서드를 호출한다. 이 메서드는 서버 소켓을 릴리즈 하고 모든 자원을 시스템을 반환한다. 그러나 accept()에 의해 반환된 연결된 BluetoothSocket은 종료되지 않는다. 이러한 모든 BluetoothServerSocket 혹은 BluetoothSocket에 관한 작업은 앱에서 별도의 쓰레드를 사용하여 처리한다. BluetoothServerSocket과 BluetoothSocket의 모든 메서드들은 thread-safe 하다. 다음은 쓰레드로 연결을 수락하는 서버 컴포넌트를 구현한 예제이다. 위의 예제는 오직 하나의 연결만 허용하는데 연결이 수락되자 마자 BluetoothSocket을 획득하고 획득한 BluetoothSocket을 별도의 쓰레드로 보내고 클라이언트 코드에서 하는 것과 같은 connect() 메서드를 호출하지 않는다. manageConnectedSocket() 은 앱에서 데이터를 송수신하기 위한 쓰레드를 초기화하는 메서드이다. 이 함수는 뒤의 연결 관리에서 설명하도록 하겠다. 일반적으로 예제에서와 같이 연결을 받자 마자 BluetoothServerSocket을 종료한다. 이것은 close() 메서드를 호출하면 되고 또한 별도의 서버 소켓을 종료할 수 있는 별도의 public 메서드를 정의하여 다른 쓰레드에서 호출하여 종료시킬 수도 있다. BluetoothDevice를 통해 BluetoothSocket을 얻고 연결을 시도한다. 다음은 이에 대한 기본 흐름이다. 1. BluetoothDevice의 createRfcommSocketToServiceRecord(UUID) 메서드를 통해 BluetoothSocket을 얻는다. 이 메서드는 BluetoothDevice에 연결할 수 있도록 BluetoothSocket을 초기화하며 여기에 파라메터로 보내는 UUID는 서버에서 BluetoothServerSocket을 오픈할 때 사용한 UUID와 일치해야 한다 (listenUsingRfcommWithServiceRecord(String, UUID)). 같은 UUID 문자열을을 하드코딩하고 서버 코드와 클라이언트 코드에서 공유하여 사용하는 것이 좋다. 2. connect() 메서드를 호출하여 연결을 시도한다. 이 메서드 호출은 시스템이 UUID를 매치시키기 위하여 원격 장비의 SDP를 조회한다. 만약 성공적으로 조회되면 원격 장비는 연결을 수락하고 연결되어 있는 동안 사용할 수 있는 RFCOMM 채널을 공유하고 메서드를 마친다. 만약 연결 실패 혹은 타임아웃(대략 12초)이 되면 예외사항이 발생한다. connect() 메서드는 블럭킹 호출이므로 항상 메인 액티비티 쓰레드와 별도의 쓰레드로 동작해야 한다. 다음은 블루투스 연결을 시도하는 쓰레드의 기본 코드이다. manageConnectedSocket()은 데이터를 송수신하는 쓰레드를 초기화하는 앱 안에서의 메서드이다. 이것은 다음 섹션에서 설명하도록 하겠다. BluetoothSocket을 다 사용하면 항상 close() 메서드를 호출하여 자원을 시스템에 되돌려 줘야 한다. 성공적으로 2개의 장비가 연결되면 양쪽 다 BluetoothSocket을 갖게 된다. 이것을 통해 장비 간에 데이터를 공유하면서 재미있는 기능을 만들어 나갈 수 있다. 데이터를 주고 받는 것은 의외로 간단하다. 1. 소켓을 통해 송수신을 핸들링 할 수 있는 InputStream과 OutputStream을 getInputStream()과 getOutputStream()을 통해 얻는다. 2. 이 스트림들의 read(byte)와 write(byte) 메서드를 통해 데이터를 읽고 쓴다. 이것이 데이터 송수신의 모든 것이다. 물론 구현은 좀더 상세하게 고려해야 할 것이다. 먼저 모든 스트림을 읽고 쓰는 작업은 별도의 쓰레드를 선언하여 구현한다. 왜냐 하면 read(byte)와 write(byte) 메서드 둘다 블럭킹 호출이기 때문이다. read(byte) 메서드는 스트림으로 부터 읽기를 마칠 때까지 블럭킹된다. write(byte) 메서드는 보통 블럭킹되지 않지만 만약 원격 장비에서 충분히 빠르게 read(byte) 메서드를 호출하지 않고 버퍼가 꽉 찰 경우 흐름에 따라 블러킹될 수 있다. 그래서 쓰레드의 메인 루프에서는 InputStream에서 데이터를 읽는 작업을 하고 쓰레드의 별도 public 메서드를 선언하여 OutputStream에 데이터를 쓰는 작업을 처리하도록 구현한다. 다음은 위에서 설명한 프로세스에 대한 간단한 예시이다. 생성자에서 한번만 필요한 스트림을 얻고 쓰레드 동작(run())에서 InputStream을 통해 데이터가 도착할 때까지 대기한다. 스트림으로 부터 byte 데이터가 도착하면 read(byte) 메서드는 즉시 반환하고 부모 클래스의 멤버 변수로 있는 Handler를 통해 메인 액티비티에 데이터를 전달한다. 그 다음 다시 스트림으로 부터 다른 byte 데이터가 도착할 때 대기한다. 데이터를 보내는 것은 메인 액티비티에서 보낼 byte 데이터를 파라메터로 하여 쓰레드의 write() 메서드를 호출하도록 구현되어져 있다. 이 메서드는 원격 장비에 데이터를 전송하기 위해 write(byte) 메서드를 호출한다. 쓰레드의 cancel() 메서드는 언제든지 BluetoothSocket을 종료해야 하므로 아주 중요한 메서드이다. 이 메서드는 모든 블루투스 연결을 통해 진행되는 작업이 마쳐지면 호출되어져야 한다. 안드로이드 3.0을 시작으로 블루투스 API는 블루투스 Profile을 사용하여 작업할 수 있는 지원사항이 포함되어졌다. 블루투스 Profile은 장비간 블루투스 기반 통신에 대해 무선 인터페이스 규약(표준)서이다. 예를 들어 모바일 폰과 무선 헤드셋을 연결하는 Hands-Free profile 이 있다. 양쪽의 장비가 Hands-Free profile을 지원한다면 손쉽게 연결될 것이다. 당신은 특정한 블루투스 profile을 지원하기 위해 BluetoothProfile 인터페이스에 대해 클래스들을 구현할 수 있다. 안드로이드 블루투스 API는 다음과 같은 블루투스 profile들에 대해 구현물을 제공하고 있다. Headset - Headset profile은 블루투스 헤드셋을 모바일 폰에서 사용할 수 있도록 지원한다. 안드로이드는 BluetoothHeadset 클래스를 제공하며 IPC(Interprocess communication)을 통해 블루투스 Headset 서비스를 제어하는 프록시 클래스 이다. 이것은 블루투스 Headset과 Hands-Free (v1.5) profile을 포함하고 있다. BluetoothHeadset 클래스는 AT 명령어들에 대한 지원 사항이 포함되어져 있다. 좀더 자세한 사항은 Vendor-specific AT commands을 보기 바란다. A2DP (Advanced Audio Distribution Profile) - A2DP는 고품질 오디오가 블루투스 연결을 통해 장비간 전달될 수 있는 방법을 정의하고 있다. 안드로이드는 IPC를 통해 블루투스 A2DP 서비스를 제어할 수 있는 BluetoothA2dp 프록시 클래스를 제공하고 있다. Profile을 사용하여 작업하는 기본 프로세스는 다음과 같다. 블루투스 설정 섹션에서 설명한 방법으로 기본 어댑터를 얻는다. getProfileProxy() 메서드를 사용하여 profile과 연관된 프록시 객체와 연결하도록 시도한다. 아래 예제의 프록시 객체는 BluetoothHeadset 인스턴스이다. BluetoothProfile.ServiceListener를 설정한다. 이 리스너는 서버스로 부터 연결되거나 연결 해제될 때 BluetoothProfile IPC 클라이언트들에게 알려주는 역할을 수행한다. onServiceConnected() 메서드에 profile 프록시 객체를 얻는다. 일단 profile 프록시 객체를 가지면 연결 상태를 모니터할 수 있고 profile과 연관된 다른 작업을 수행할 수 있다. 다음은 headset profile을 제어할 수 있는 BluetoothHeadset 프록시 객체를 얻는 방법에 대한 예시이다. 안드로이드 3.0 부터 headset들에 의해 전송되는 미리 정의된 vendor-specific AT 명령어들(Plantronics +XEVENT 명령어 등)의 시스템 브로드캐스트를 받을 수 있도록 등록할 수 있다. 예를 들어 앱은 연결된 장비의 배터리 량을 가리키는 브로드캐스트들을 수신받을 수 있고 사용자에 대해 전달받을 수 있으며 필요한 다른 액션을 획득할 수 있다. headset에 대한 vendor-specific AT 명령어들을 핸들링하기 위해서는 ACTION_VENDOR_SPECIFIC_HEADSET_EVENT 인텐트에 대한 브로드캐스트 리시버를 생성하여 등록하면 된다. 가끔 헤깔릴때가 있는데 센서값은 manifast 에 등록시켜주지 않아도 잘 작동한다. Thread - Handler 방식은 UI 쓰레드와 스케쥴링같은 효과가 안된다. 때문에 asyncTask 로 구현을 해보기로 결정! 잘되면 이어서 포스팅하겟다. 가운데 굵게 표시된 부분을 추가해야 한다. 이유는 저렇게 하지 않으면 화면이 회전될때 액티비티가 새로 onCreate를 수행하기 때문에 정상적인 동작이 되지 않는다. 저렇게 해주면 화면모드 전환을 액티비티에서 알아서 하겟다는 의미이다. 메소드 이름도 직관적이라 참 알아보기 쉽다..
44번줄 작업이 끝난 후 호출 되는 Callback이다. 50번줄 작업이 시작하기 전에 호출 되는 Callback이다. 이라고 생각하면 될 듯 하다. 아 참고로 AsyncTask를 사용 할 때는 항상 SubClass로 구현하라는데, 이유는 찾아봐야 할것 같다. # Service란 액티비티와는 반대로 눈에 보이지 않는 작업 단위를 처리하는 객체이다. 따로 종료해주지 않는 이상 앱을 종료해도 살아있다. 순서대로 handler에 보낸다. handler는 받은 메세지를 Notification(알림)을 통해서 출력한다. * 서비스에서 수행할 작업을 수행시키고 재빨리 리턴한다. * 시간이 오래 걸리면 서비스가 취소된다. //백그라운드에서 작업할 내용을 초기화 하고 시작한다. thread=null;//쓰레기 값을 만들어서 빠르게 회수하라고 null을 넣어줌. //핸들러로 들어오는 메시지별로 다르게 동작. 서비스를 띄우고 액티비티가 종료시 다시 띄울때 서비스를 체크해 줘야 한다. private static final String serverIP = "10.0.2.2"; //serverIP를 추가합니다. private static final int port = 8000; //서버에서 설정한 UDP 포트번호를 추가합니다. //TCP와 다르게 UDP는 byte단위로 데이터를 전송합니다. 그래서 byte를 생성해줍니다. //받아온 msg를 바이트 단위로 변경합니다. SO ListView 라이브러리 - 1.0 입니다. 안드로이드 개발 할 때Custom listView 를 간편하게 구현 할 수 있게 랩핑된 라이브러리 입니다. 사용법 문의및 추가 기능이 필요하신 분들은 댓글 남겨주시기 바랍니다. Thread 에서 소켓 통신을 하고, 그 값을 받아 올때마다 UI를 변경 시켜 주고싶을때, MainActivity를 그대로 넘겨버릴 수도 있지만, 그렇게 되는 경우 Activity의 전환시 그 통신을 계속 할수가 없다. Thread 를 다시 생성하여 그 Activity를 넘겨줘야 하기 때문이다. 이런경우 우리는 singletone pattern 과 Handler를 이용하여 완벽히 해결 할 수 있다. Thread 에서 UI 같은 Main Thread 의 값을 변경해 주기 위해서 MainThread 의 역할을 잠깐 위임해 주는 것이다. C#에서는 delegate가 비슷한 역할을 한다. 사용법은 아래의 출처 예제코드가 가장 간단하고 이해하기 편하다. 우선 MainActivity 에 Handler 클래스를 선언해 준다. Override 를 통해 HandlerMessage를 재정의해준다. 그리고 MainActivity에서 Thread 를 생성시에 이 핸들러를 넘겨준다. Thread 안에 Thread 시에도 이 핸들러 값만 이어서 가져가 주면된다. 이후에 이 핸들러의 sendMessage를 통하여 인자값을 전하고 원하는 메소드를 호출 시킬수 있다. 멤버십 과제중 프로토콜 맞추기가 너무 시간이 오래 걸림에 있어 JSON 규약으로 통신을 맞추기로 했다. 게임 개발자의 편의를 맞추기 위해 JSON 방식을 좀더 사용하기 편하게 객체화 시켜 보았다. 이 포스팅은 오로지 필자가 개인용도로 만든 것이기 때문에, 다른 사용자에게는 오히려 불편할 수 있음을 미리 전한다. json.putJsonInit(); //json 초기화 부분.. 값을 입력하기전 반드시 해야한다. json.putJson("key1","test1"); //key 값과 value 값을 이어서 필요할때마다 추가해 줄수 있다. String aaa = json.putJsonFinish(); //obj 를 다만들었으면 그것을 array에 추가하는 부분이다. 필요에 따라서 여러개의 오브젝트를 배열로 추가해주는 방식으로 변경할 수 있다. json.getJsonInit(aaa); //JSON array 안에 obj 형식으로 들어오는 JSON 만 파싱 가능하다. Log.e("result value",":::: resutl : "+json.getJson("key1")); //getjson 으로 값을 가져 올 수 있다. 멤버십 과제중 안드로이드로 게임통신을 해야하는 부분에서 자바에 WSASelect 가 없으므로 비동기 소켓을 보내고 받는것이 익숙치 않았다. IOCP 소켓이란 것이 이미 윈도우의 이벤트를 이용 하는 것이기 때문에, 자바에서는 100% 맞는 통신은 없지만, 아래와 같이 channel selector 를 이용하여 비슷한 효과로 비동기 소켓을 처리 할 수 있다. 자바는 WSAselect 가 없기 때문에 IOCP 통신을 해주기위해서 select 개념을 사용해야 한다. // 비 블록킹 모드로 설정한다. // 서버소켓 채널을 셀렉터에 등록한다. // 셀렉터의 select() 메소드로 준비된 이벤트가 있는지 확인한다. // 셀렉터의 SelectoedSet에 저장된 준비된 이벤트들(SelectionKey)을 하나씩 처리한다. // 이미 처리한 이벤트므로 반드시 삭제해준다. sleep(400); //소켓 연결하는 동안 잠깐 대기. // 요청한 클라이언트의 소켓채널로부터 데이터를 읽어들인다. MainActivity 에 update() 를 두고 MainActivity 를 넘기게 되면 디버깅시에는 잘 동작하는 것이 실제로 동작 시키면 잘 안되는 현상이 일어난다. 이는 UI Thread는 외부 Thread 에서 참조할 수가 없기 때문에 일어나는 현상이다. 이를 해결 하기 위해서 Handler 라는 개념을 사용 하게 된다. 시스템은 사용자가 작성한 UI에서 빠른 응답을 요구하고 있다. 만약 이상의 응당이 없을 경우 최악의 경우 작성된 프로그램이 강제로 종료가 경우도 발생할 수 있다. 이런 상황을 방지하기 위해서 오래걸리는 작업이 필요한 경우 두가지의 방법으로 해결을 할 수 있다. 두번째 방법으로 생성해서 데이터 처리등의 시간이 오래걸리는 작업을 지원하기 위한 클래스가 존재하는데 핸들러(Handdler)이다. 백그라운드 생성을 위한 가장 유연한 방법이다. 인스턴스 생성시 자동으로 안드로이드가 관리한다. post(), postDelayed()를 통해서 인자로 실행하고 자하는 Runnable객체를 전달할 수 있다. View단에도 Runnable객처를 인자로 전달가능하고 이럴경우 코드가 심플해지는 경우도 있지만 Handler를 추천한다. UI등에서 실제로 처리를 담당하는 데이터를 전송하거나 작업을 요청하기 위해서 전달하는 객체이다. 전달된 메시지는 메시지 Queue를 통해서 핸들러가 사용한다. 메시지를 전달하기 위해선 핸들러의 obtainMessage()호출해서 메시지 풀의 메시지를 전달해야한다. 메시지를 전달하기 위해서는 sendMessage() 등을 사용한다. sendMessage() - 큐의 메시지를 삽입한다. sendMessageDelayed() - 특정시간만큼 지연 삽입한다. [ Android ] Json 방식으로 묶기. 구조체처럼 변수를 한번에 실어 나르고 싶지만, 그 타입이 불특정할때.. 객체 자체를 전송시키지만, 그값이 데이터 베이스나 그런곳에 들어가기엔 정규화되어 잇지 않을때 사용하기 좋은것이 바로 JSON 방식이다. JSON 방식은 크게 2개가 묶여 있다. Array 와 Object 이 두가지가 그것이다. 이 array 안에 object 를 담애 낼수 있으며 , object 안에 array를 담아 낼 수도 있다. 간단하게 배열 안에 여러개의 변수가 담긴 Obejct 를 넣는 방법을 예시로 들어보겠다. 넣고자 하는 문자열은 다음과 같다. 위에 설명에 따라 한행의 배열안에 OBJECT가 들어가 있고 그 오브젝트는 key3 key2 key1 로 들어가 있다. 각 키는 하나의 값을 가지고 있다. 서론 : 이 과정은 아래글인 JNI 설정법을 먼저 읽어두고 숙지한 상태로 진행 한다는 것을 전제로 하겠다. 안드로이드에서 카메라색상 값을 추출하면 그 값은 YUV 값으로 추출된다. 하지만 영상처리를 위해서는 YUV값보단 RGB 값으로 도될려주는 것이 더 간편하다. 때문에 안드로이드에서 YUV 값을 RGB 값으로 변환 하여야하는데, 인터넷에서 돌아다니는 소스는 대부분 자바단에서 YUV->RGB 로의 변환이 많다. 이렇게 될 경우 실시간 이미지 프로세싱을 하게되면 속도가 NDK 보다 느려짐이 발생 할 수 있다. 때문에 YUV 값을 C언어단으로 보내어 RGB 처리를 한후 이미지 프로세싱을 하고 그결과 값을 리턴하는 식의 진행을 하게 되었다. 1. native 메소드를 생성 후 C언어 헤더 만들기. 2. 그 헤더의 전처리 함수를 이용하여 .c 파일의 RGV 값 추출 코드 만들기. 3. 포인터 형태로 RGB 값을 리턴하기. 4. 리턴한 값을 비트맵으로 만들기. 1.native 메소드를 생성 후 C언어 헤더 만들기. 맨아레 코드처럼 private native void 형으로 함수명을 선어해 주면 javah 명령어를 통해 C언어와 연결되는 헤더가 만들어 지게 된다. android.mk 파일 내용은 다음과 같다. (기존 JNI 문서보다 LOCAL_LDLIBS 환경변수가 추가되는데, 필자도 어떤 설정인지 파악을 하진 못했다. 위와같이 LOCAL_LDLIBS 환경변수를 추가적으로 주고 LOCAL_MODULE 에는 만들어질 라이브러리명, LOCAL_SRC_FILES 는 C파일명 을 설정해서 .c .h android.mk 파일 세개를 JNI 폴더로 옴긴 뒤 빌드 한다. 위그림에서 초록색 박스가 필자의 블로그에서 소개했던 기본 [Camera 를 surface 뷰로 띄우기] 에서 변경된 부분이다. callback 함수에서 mainActivity의 ImageView 값을 변경해 주기 위해서 MainActivity를 인자값으로 넘겨서 실행 시키게 했다. 아래 빨간색 네모박스는 mHolder에 callback 함수를 추가시키는 부분이다. 별다른 내용은 없다. 그리고 노란색 박스는 콜백함수의 구현부이다. 중요한 부분은 파란색 박스의 prBitmap 부분이다. 이부분에서 빈 bitmap 파일을 ARGB8888 형태로 선언해두고, 리턴한 바이트 값을 비트맵으로 받아올 준비를 한다. 이값을 바탕으로 native 함수인 YUB420SPtoRGB8888NEW 함수에 data를 넣고 prBitmap 으로 리턴 받게 된다. 이렇게 카메라 값을 native 에 넣었고 RGB로 변환 후 꺼냈으므로, 그사이에 영상처리 기술을 얼마든지 넣을 수 있다. 필요한 부분은 차차 구현해 나가고 결국엔 비트맵으로 출력해오면된다. 중요한건 속도인데, 16~40프레임 선에서 처리가 된다. // Processes each pixel and converts YUV to RGB color. // Y is divided by 2 because UVs are subsampled vertically. // same UV line (e.g when Y=0 and Y=1). // horizontally too, hence %2 (1 UV for 2 Y). // Computes R, G and B from Y, U and V.
// Combines R, G, B and A into the final pixel color.